In our last blog post, we touched on the topic of how low morale negatively impacts employee performance and productivity. So now that we have pointed out an issue that plagues many companies, what are some ways we can raise company morale? After asking around the office, the biggest drain on employee morale (and the most common reason for people to leave their position) is micromanagement. No one wants to have someone looking over their shoulder and have to do things in a specific order (some roles may require this, I admit) that ends with the same result. How then, can a manager ensure that the work gets done on time but also have the employees not feel they are under a microscope? Have reviews and deadlines at set times discussed at the beginning of a project. Why beginning? Sure, there may be minor tweaks to every project, but to constantly change up the timeline by adding reviews or bumping up the deadline multiple times, it seems an awful lot like micromanagement. Remember, you hired them for a reason: they are good at what they do! Nobody likes cubicles. Think of a stereotypical one. 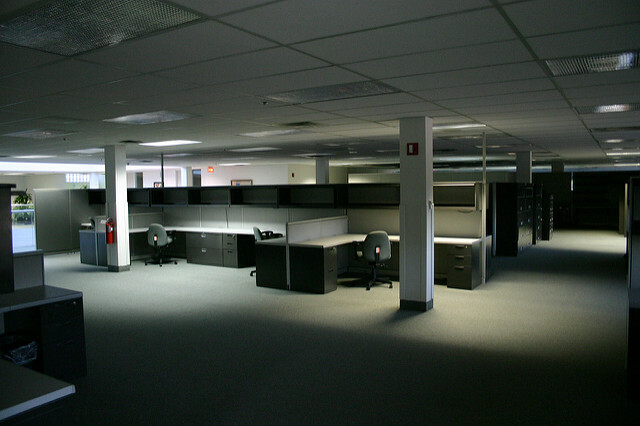 Oftentimes, these dividers separate team members and block out natural lighting. David Bowden, a spoken word poet says about them in his poem “The Cubicle”: “A self-contained life in our self-restrained crucible, where nothing but gray walls fill our opticals […] but this does not have to be business as usual.” And he isn’t wrong. While not all of us can afford to have offices like these, small tweaks can make the office space more enjoyable. Firstly, no one wants to work in a dusty, dirty and dingy office. Swap out some light bulbs, and have the facilities cleaned. If possible, open up the space by removing the walls altogether and allow for some natural light to shine in. Keeping the office clean is an ongoing collaborative effort, and also allows the employees to take ownership of their workspace. If things are already dirty everywhere, employees are likely to accept it as the norm. This minor culture switch from dirty to clean could be the start of improving morale. Secondly, add some color! Be it some paintings, plants or even pets (make sure everyone is comfortable with this, instead of just one person who insists that bringing in their pet snake will make their work more enjoyable). Hey, your new haircut looks great! How was that event you went to during your time off? People love to know that they matter. As a manager, by making conversation and asking how others are doing, you are creating an environment where they matter outside of just work. And if someone did a good job, let them know! Knowing that their efforts were noticed will make their work seem worthwhile. That way next time, they will put in the effort knowing that someone cares. When talking about flexible schedules, the topic always shifts towards working from home (telecommuting). While this may or may not work for different companies (there are examples of both good and bad), this isn’t what I’m focusing on. Rather, I am talking about the flexibility of the schedule in-office. If someone is scheduled to work at 9:00 and due to traffic doesn’t come in until 9:10, don’t pull them into your office and give them a warning. Instead, consider letting them make up the time working 10 minutes later. Or if they have been really stressed out due to multiple projects, it may not hurt to let them take an extended lunch break (part of recognizing their work as mentioned before). Of course, the type of flexibility can vary depending on work requirements, but generally, more flexibility is appreciated rather than a more rigid clock-in, clock-out system. Nothing hurts employee morale more than having a senior position hire come from outside the company. The majority of people work hard hoping to advance in their careers through their organization. Could you imagine someone working extra hours and producing great results, only to have the position taken by someone from another company? All that hard work would feel as though it amounted to nothing (again, the feeling of work being recognized). Also, it doesn’t just stop there. Even if the person coming in was the nicest person in the world, there might still be some feelings of negativity towards them. Instead, when possible, hire and promote from within the company. This not only improves employee morale but also allows you to keep top talent within your company. If a promotion is not an option at the time (not experienced enough), allow employees to take on additional responsibilities and create a culture of succession planning through mentorship. Don’t have your team drink soup with a fork. I don’t mean that literally, but, to increase employee morale, the team needs to be able to do their jobs with as little barriers as possible. No one wants to jump through hoops just to make something that should be simple result in several workarounds. This not only makes employees feel that their time is wasted, but this also costs the company money. How? While the company may be saving the money by using older equipment and software, they are losing it in productivity (getting actual work done). Give your employees the tools they need to do their job. What are your personal tips on improving morale in your work environment? Let us know in the comments below or on Twitter.